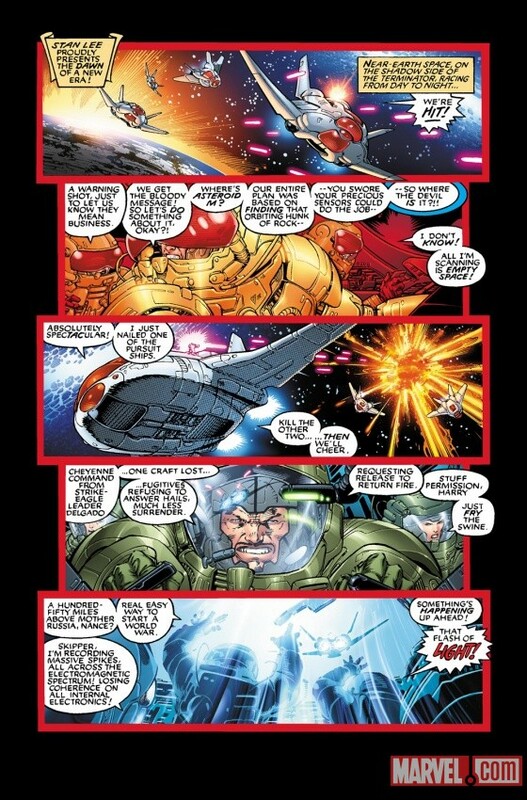 Last week, we spent some time talking about Geoff Johns and Jim Lee’s Justice League #2. Regardless of what people think of DC Comics’ New 52 relaunch or this retelling of the first meeting of their greatest heroes, the book is gorgeous. Justice League #1 was a top seller and there’s no reason to think the second issue won’t be near the top of the list as well. It may even be the best selling title since Chris Claremont and Lee’s X-Men #1 from 1991, which made it even more surreal seeing them on the shelves together last Wednesday. It’s easy to second guess Marvel’s true motives here, but re-releasing a Jim Lee X-Men book was a little surprising even if it is the 20th anniversary of the debut of the best selling comic book of all time. The publisher is also just entering a rebranding of their X-Men line under their Regenesis banner that includes a new volume of Uncanny X-Men and a new Wolverine and the X-Men series that started shipped this week. Regardless, it was crazy to see a new edition of Jim Lee’s most recognizable book shipping alongside his latest. It’s particularly odd when you consider that Lee has ascended to the role of co-publisher at DC and ushered in huge sales with the “New 52” relaunch, outselling Marvel’s line for the first time in years. 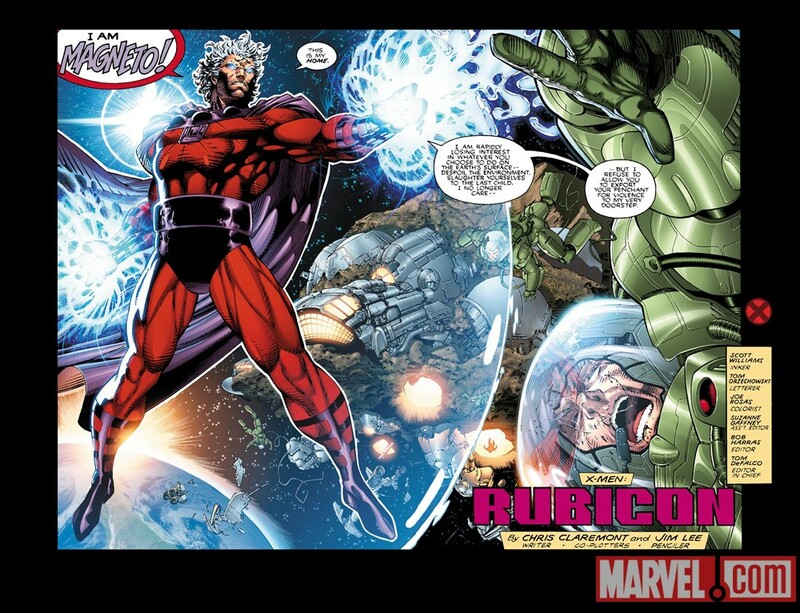 Preview images courtesy of Marvel.com. The major upgrades for this reprint are improved paper quality and modern coloring techniques applied to the book. I’ve always thought Lee’s X-Men #1 was a gorgeous book, and this edition really shines. I’m particularly fond of this new rendition of its panoramic double-gatefold wrap-around cover. 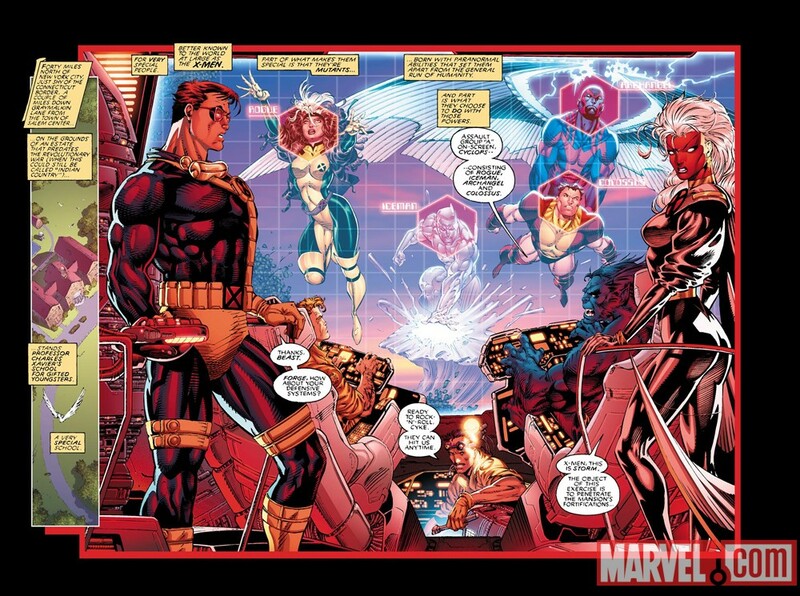 It’s a great new addition to a series of widescreen X-Men images I can’t get enough of. It’s a testament to Lee and inker Scott Williams’ talents and I found myself really appreciating the update. I got around to re-reading the book this week (which I wasn’t sure I’d do) and it brought back a lot of good memories. It was nice to see Beast and Cyclops’ relationship, along with its friendly verbal sparring, front and center. Considering the two long time friends currently seem more divided than Cyclops and Wolverine, it was a poignant reminder of how close the two once were. I also found it remarkable just how much Rogue has changed, particularly in recent years. I didn’t think I’d enjoy her going back to her roots and dropping the Ms. Marvel borrowed powers of super strength, invulnerability and flight nearly as much as I do. That’s entirely due to Mike Carey’s handling of the character in X-Men: Legacy. It’s hard to believe this is the issue that kicked off that series which is now the longest running X-title with the renumbering of Uncanny X-Men. No ads and the pinup images at the back added to the good feelings this book provided and I wouldn’t mind seeing Marvel continue this treatment with the first three issues of Claremont and Lee’s X-Menseries. If nothing else, it would help me remember who these particular Acolytes (other than Fabian Cortez) that serve as the issue villains were. Classic X-Men ran for years reprinting issues of Uncanny X-Men, and this book has certainly reached classic status as well. Although the availability of older issues in collected editions and the advent of digital distribution has reduced the value of that type of reprint series in today’s market. Even if we don’t see anything beyond this new edition of issue one, it was a real treat for an old X-Men fan.